Question: I cannot get this to flow reliably into the nib of my Marsh 99. I've tried thinning it with acetone and roughing up the nib. I also cleaned the market out with acetone before I used it. Any other ideas? Or is K Grade the only thing that works with the 99? 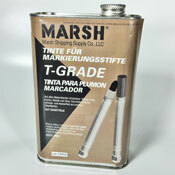 This industrial valve-activated marker is designed for specific and demanding applications, and features a refillable ink chamber. In addition, interchangeable round or chisel tips are available. Question: will this mix well with OTR flowpen ink? Question: What's a good way to thin down the white marsh? I'm all about the marsh/garvey combo for the black and it conveniently thins it down, but how can i keep an opaque white in a marker? magic ink? Answer: (AP Reply) You can add acetone which will thin it down a bit. Be careful you don/t add too much or you/ll thin it down and make it transparent. ADD A MIXING BALL! Question: Bit of an odd question but do these expire fast? specifically the white. I'm looking at getting a tin but I want to make it stretch for a year. I'll be shaking it hard out every so often so it doesn't get too caked too lol. Quite the investment so I wan't to make sure. Answer: (AP Reply) No, this has no expiration date. Make sure you seal this back up tightly after every use. Question: If you mix 50/50 gravey and marsh T-grade what would be a better choice for a louder tone of colour red or blue marsh??? Answer: (AP Reply) Garvey is purple, so it would muddy both red and blue Marsh when mixed.